Welcome to Hilton Cairo Heliopolis, an iconic hotel in the presidential quarter just 12 minutes from the airport and 15 km from city center and the business district. 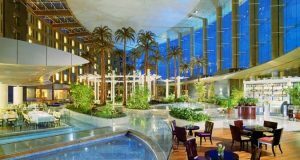 The design of Hilton Cairo Heliopolis comprises a mix of contemporary art and authentic decor that echoes modern Cairo along with the distinct Egyptian heritage. From the unequaled spacious guest rooms to the state-of-the-art conference facilities, from the water passages across diverse array of restaurants’ themes to the mesmerizing day-lighted atrium, every detail accentuate the pleasing interaction of light, water, and natural living elements. Enjoy attentive service and unrivaled amenities such as 15 dining outlets, a wellness spa, beauty salon, two outdoor pools, a fitness center and sport courts. 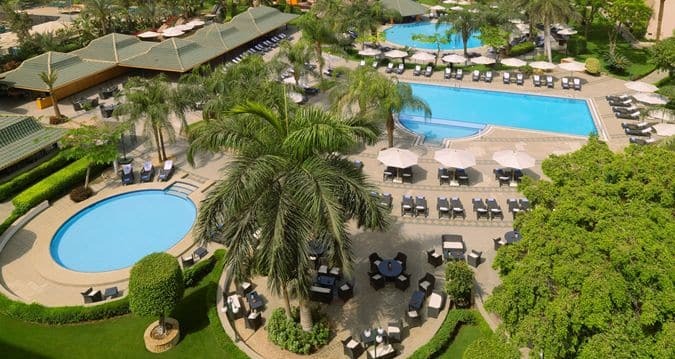 Corporate travelers have their choice of the largest event space in Cairo, and families will love our poolside cabanas and children’s playground. Located in the city of the sun, Heliopolis, where ancient Egyptians chose to celebrate life, creation and the sun, the Hilton Cairo Heliopolis enables its guests to easily reach Cairo International Conference Center, the palace of the modern Heliopolis founder, Baron Empain, the Virgin Mary’s Tree, and many more of the legendary Cairo attractions.